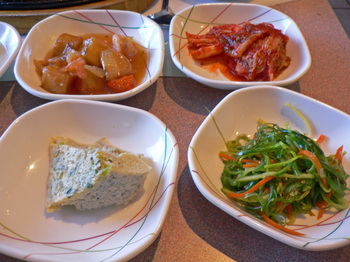 Korean Hometown Restaurant - mmm-yoso!!! I really don't know the Korean name of this restaurant, so will just go by the English sign. I first noticed this little restaurant over a year ago. We had finished a nice meal at China Max, and were wandering around the strip mall, when I noticed a Woman running two plates of Mandoo over to the Pool Hall located right next door. Even though I was stuffed to the gills, it still looked pretty good. A few days later I received an Email from our eating buddy Calvin; who mentioned that "the food is like what my Mom and Aunts make, and the sometimes surly service is like what you'd get at home." Hmmmm.....sounds good, after all Mom's make the best food, right? Hmmmm...sounds bad, remember how Mom acted when you didn't eat your peas???? Or when that "Tuna Surprise" really did surprise??? Recently the Missus and I finally made our way to this restaurant. The interior is full of wooden booths, with Soju posters on the walls, along with a closing time of 2am on Fridays and Saturdays, I could sense pretty hearty grub. This really is a Family operation. We were first served by an Older Lady, and later on when 2 other Young Women(daughters?) walked in, they immediately started waiting on us as well. A Middle-Aged Gentleman was manning the kitchen. 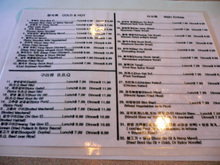 We looked over the menu, and placed our orders. And soon enough our panchan arrived. The portion size of the various panchan were pretty good. And the quality ranged from some pretty tasty stuff, to very, very mediocre(iceberg lettuce salad with thousand island dressing??). 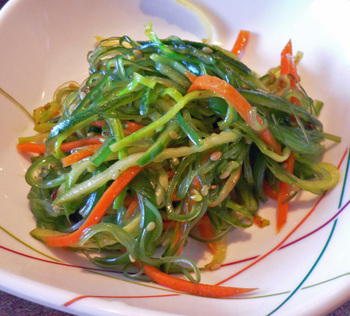 The Seaweed Salad wasn't bad. 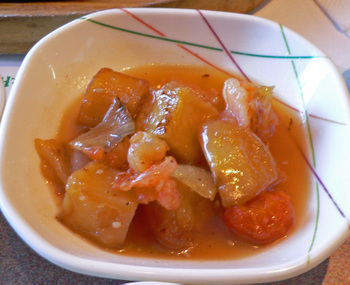 Even though the Baechu(Napa Cabbage) Kimchi wasn't the best, it was still passable. As was the most of the panchan. We were starving so we basically attacked the panchan. And even though we were in the secluded corner booth, the Older Lady came by just as we were finishing up our panchan, looked at us, and said, "Oh, you hungry, huh?" To which we pointed out the stuff we liked and said "It's really good". Damned if She didn't break out into a smile, and a minute later came back with a second round of panchan...and we didn't even ask! Just like Mom???? The Missus, being absolutely starved had ordered the Combination BiBim Naeng Myun and Bulgogi($13.99). 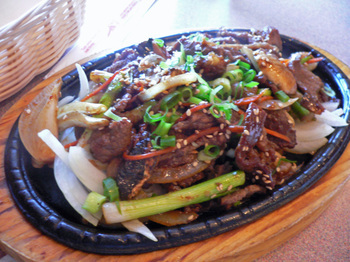 Not knowing what to expect, the usual metal bowl of rice, and a sizzling plate of Bulgogi arrived at the table. The Missus enjoyed the Bulgogi, though I told Her it was on the sweet side, and with the mushrooms and carrots it was almost like a stir fry. I will say this, it wasn't bland in the least. With some help She managed to finish the Bulgogi, only to be met with this. 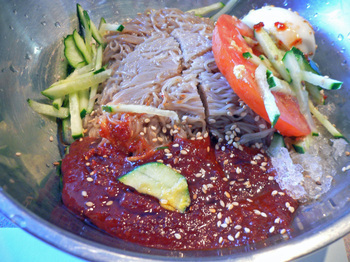 The BiBim Naeng Myun(spicy cold noodles). Geez, do you think this was enough food? I didn't think this was very good, the Hot sauce tasted earthy and beany, but without any sweetness, or tangy flavor, and suffered from a lack of depth. The noodles were not good either, instead of having a taut elasticity, they were on the mushy side. The ice was shaved frozen broth. Overall, not something I'd have here again. This was a large portion of rice, that had been stir fried with a generous helping of Spam(must've been a half can! 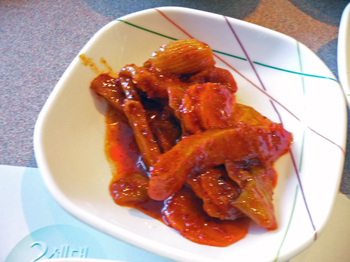 ), some kimchi, and Gochujang. I really enjoyed this, the sour hints from the KimChi kinda freaked the Missus out, so She ate the Egg! Try as I might, I couldn't finish, so I had the rest the next day. It's the only item that's priced the same for lunch and dinner. Is that saying something? Damn!!!!! 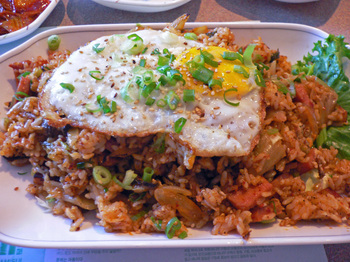 That Kimchi Spam fried rice just made my stomach cry out in hunger. That looks soooo good. Seriously, I am so hungry now, I feel like I can smell the dishes...[drool]. Kimchi spam fried rice? Sounds like a great breakfast....right now! Excellent! 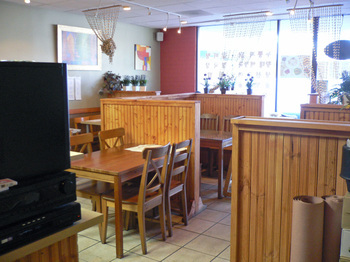 Another Korean place to try. I think I'll check it out this weekend. Looks lovely and lots of interesting details as per usual chez Kirk. *sigh* Now I've got a spam craving. Where's a Sam Choy restaurant when you need one? 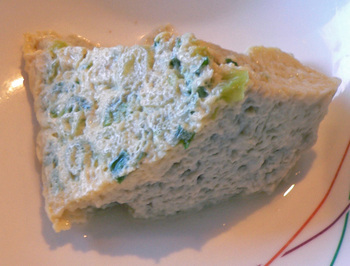 So, you are going to try the Chrysalis (aka the infamous silkworm larvae) soup, eh? Let us know how that goes! Noooooo! Not bondeggi!!! Don't do it man, they're evvvviiiillll! ditto for the "Spam and Kimchi Fried Rice." The egg on top really makes the dish. Hi Nhbilly - I hope you had a good meal! Hi Rob - It was pretty good, at least I thought so...tho' it could've been that I hadn't had Kimchi Fried Rice in ages. Hi Jack - Breakfast, Lunch, or Dinner.....really good anytime. Hi Denver - Hope you enjoy yourself. Hi Emily - Tell you what, I'll try to explain in a future post. Hi Jenn - Was it that bad???? Hi RONW - That's the Cherry on the top, ain't it? 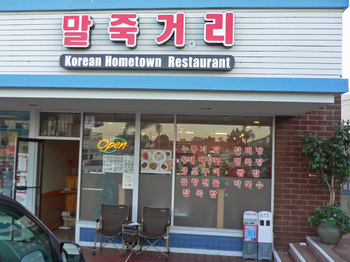 I happened to drop by Korean Hometown Restaurant today to try out their cuisine, and I noticed that the Health Department grade posted in the window was a "B." Having never seen a "B" outside of LA Chinatown, I decided to get my Dolsot Bibambap at Tofu House instead. Interestingly enough, in the first photo above they have an "A" posted. I would assume that they got inspected by the Health Department between then and now and were found lacking. Hi Fred - After living in LA for a number of years, a 'B' rating doesn't bother me a whole lot...unless it's a sushi/sashimi/raw food type restaurant. I tried this place, and the portions are hearty, but a bit on the pricy side. The egg was missing on the spam & kimichi fried rice, which I surely would have enjoyed. But overall not bad. I haven't tried alot of korean places since I have moved from San Antonio, TX . . . but I will venture to do so more often. Hi RCLC - If you think KHR is expensive....I think you'll be in for a bit of a shock. 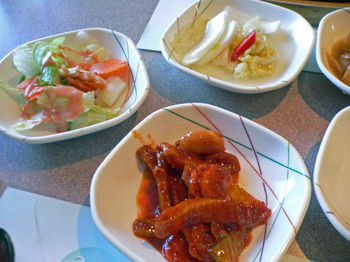 Lunch is probably the most inexpensive way to go for Korean food in San Diego, since most places have lunch specials.